For our monthly subscribers, you can cancel at any time and we will not charge your card again. No questions asked! You can try IRS Solutions with a risk-free, 60-day trial. You will receive a full refund if you cancel during this period. We have a monthly fee charge after that depending on the amount of users in your company or organization. If you cancel before your billing date each month your credit card won’t be charged again for any subsequent months (refunds will not be issued if you do not cancel within 60 days). Are there any specific applications or hardware I need to have before I can use IRS Solutions? There are no specific hardware requirements. All you need is Internet access with a compatible browser such as Firefox, Chrome, Internet Explorer or Safari. Do you store e-services usernames & passwords? No, we do not store your IRS e-services usernames and passwords. When you access our IRS transcript tool, you will need to enter your username and password as well as a pin sent to you by the IRS via a text message or the IRS2Go app each time you access the software. We take security and privacy of both you and your clients very seriously. 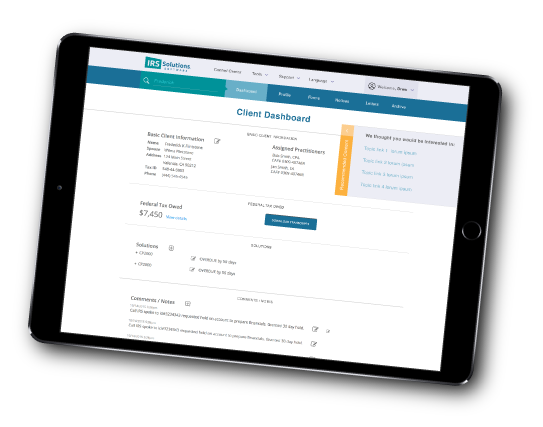 Also, the IRS now requires you to notify your clients if you plan to use our service to download IRS transcripts. There are new check boxes on the Form 2848(power of attorney) and Form 8821(tax information authorization) that you will need to have your clients check before accessing their transcripts through a third party service provider such as us. I signed up, but cannot log in, help! When you first subscribe it is necessary for you to log out and then log back it to the program to gain access. Go to the homepage and select logout under the member login box. If you are logged in it will say your username. Go to the top tab where it says your name and hover your mouse over it and select log out. Then when you log back in you will be automatically redirected to the software control center. If you have issues with your login try the reset button or give us a call. Can we run IRS Solutions on our own servers? IRS Solutions is a web-based, hosted service. We own the software, and license it to you. How can I reset an expired or forgotten password? Can I get my data out if I want to discontinue using IRS Solutions? What IRS forms are included? Feel free to contact us here – Contact Us.